Editor’s note: This article was written before the announcement of the final England squad. It is certainly not clear what starting role Rooney will play when England open against Russia on June 11. Some pundits, such as former England captain Alan Shearer, have questioned Rooney as a striker saying “the days of Wayne being the number one striker are gone”. But Shearer stopped short of dismissing him altogether by suggesting he could play midfield. Here, we take a closer look at the statistics and compare Rooney to one of the main rivals for his position in the team: Tottenham Hotspur’s Dele Alli – the 20-year-old player whose first season playing in the Premier League has been an undoubted success. Of course, England fans will want to maximise the probability of their team finally winning the Euros – so England manager Roy Hodgson needs to pick the best player in each position. Will there be a place for Rooney? Or is it time for him to step aside for one of England’s top prospects? We start our investigation by considering some simple passing and shooting statistics for the two players for this season. The table below shows some statistics for both players based on performances in the Premier League this season. A word of caution: when interpreting simple descriptive statistics like these, we do not know the situation or surrounding circumstances that have generated these numbers. For example, some shots may be from long range, a player may be instructed to play in a certain way by the manager so that he passes a lot to the side, or a player may be used in matches against top opposition, meaning his team has less of the possession (and hence fewer passes are made). 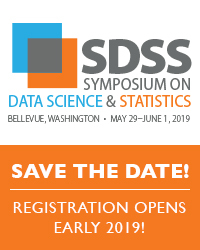 None of these things are accounted for in simple descriptive statistics. Nevertheless, they do make for an interesting comparison. First, look at the goal differences for each player’s team while they are on the pitch and while they are off the pitch. Both have a positive influence on the team – the goal difference increases in both cases but Alli makes a particularly big difference, increasing Tottenham’s goal difference from +0.21 to more than +1 goal per match. 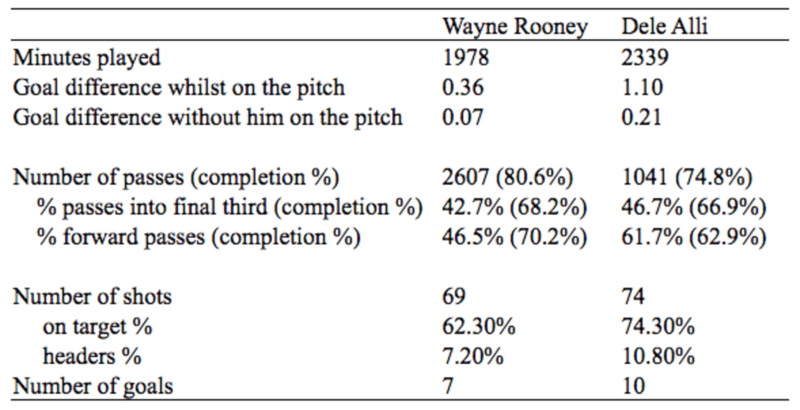 Having played about the same number of minutes, it is noticeable that Rooney has played well over twice as many passes. However, a much higher percentage of Alli’s passes are forward (61.7% compared to Rooney’s 46.5%). When it comes to shooting, both players generate about the same number of shots, though Alli has a higher on-target percentage and has scored three more goals. And then there are heat maps. The figures below show heat maps of the pass origins for Rooney and Alli. Comparing the origins of the passes of the two players, Rooney’s heat map suggests he is rather static compared to Alli. The next two figures show the heat maps of the destinations of the passes of the two players. The point of note here is perhaps more indicative of Manchester United’s style of play than it is of Rooney. Looking at the pass destinations, Alli’s seem to be spread out while Rooney’s are almost bizarrely regionalised to four positions across the midfield. This possibly suggests that Manchester United attacks are rather rigid in nature. Then there are of course, goal assists – the final pass before someone scores. Alli notched up nine in his Premier League games this season against Rooney’s six. At the University of Salford we have developed a suite of algorithms for rating players and using these ratings for predicting the results of matches. We house these tools in SAM, our Sports Analytics Machine. A major reason our predictions are working so well is our player ratings. We have two different player ratings: a performance rating (in any one match this measures how an individual player performed); and an overall rating (given a player’s individual attributes and looking at his performances over the long term, this rating gives an idea of what we should expect from the player in future matches). Below is a plot of Rooney’s expected and observed match performances since the start of the 2014-15 season. Notice a pattern? Rooney has, in the majority of matches since February 2015 (coincidentally, around the time he signed a five-year contract for a reported £300,000 a week), under-performed. You can see how our overall rating is slowly being downgraded as the ratings model “learns” that Rooney isn’t the player he once was – he has been under-performing for more than 18 months now and is currently averaging a performance rating of around 65. This is actually below average for a striker in the Premier League, and certainly below what would be expected of a striker in a team chasing a top-four finish. Alli’s observed performance and expected performance ratings for this season are shown below. Alli is expected to perform at a lower rating than Rooney (the blue dots are increasing to the mid-70s while Rooney’s are decreasing to the mid-70s). On the whole, Alli is performing as we would expect. As a comparison to a player that is under-performing (Rooney) and performing as expected (Alli), consider the expected and observed performance ratings for Jamie Vardy. He has outperformed expectations for almost the whole of the 2015-16 season. Indeed, when we look at the player ratings for all players, Vardy should certainly be playing in Hodgson’s Euro 2016 team. So what can we conclude? Should Hodgson choose an under-performing player on the decline – or a player on the rise? Rooney has insisted he deserves a place on the team. But as a fan, I know which player I would like to see in the first game in France.